This isn’t so much a tutorial as just a set of simple instructions. I KNOW about sewing, but just CAN’T do it. You should have seen my sewing projects in high school home-ec! Let’s just say no human could ever wear those clothes! What “Cookie Cutter Christmas Tree” would be complete without a few homemade cookie cutter ornaments made from fabric or felt? You can make these to look like cut-out cookies & gingerbread or make them in seasonal colors & patterns. They can be sewn, or if you are like me and can’t – glued. These ornaments may be placed on the lower branches, as pets and small children cannot break them! Trims: lace, rick-rack, ribbon, yarn, etc. Fabric or felt on-hand or around $5. Cotton, fiberfill or quilt batting on-hand or around $3 (I got enough quilt batting to “stuff” at least 2 dozen ornaments for 99 cents). Trims & embellishments on-hand or under $5. I had everything on-hand from previous projects so these ornaments were FREE to me. Otherwise you can make several dozen for less than $15. 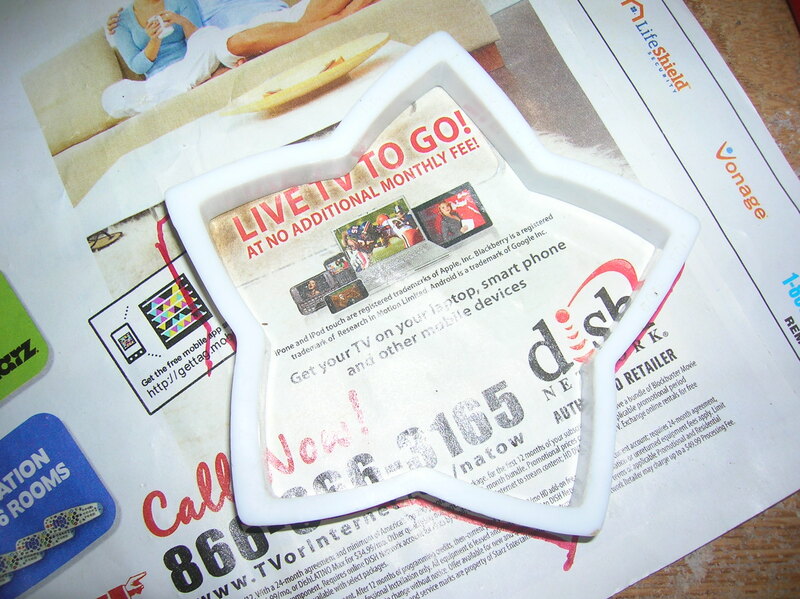 Choose large cookie cutters with simple shapes, such as Christmas trees, gingerbread men, hearts, stars and wreaths. Trace each cookie cutter onto newsprint to make a pattern. Double the fabric with the patterned side on the outside for both sides and then pin the pattern to holiday fabric (such as a Christmas calico) or felt so that you cut out two matching pieces for each shape. With the right (patterned) sides together, sew each ornament by hand or machine, leaving a small space open for turning. Turn ornament right side out. Stuff lightly with cotton or fiberfill. To stuff with quilt batting cut several slightly smaller shapes from the batting (make a copy of the pattern and then trim it down about 3/4ths of an inch. Also cut several squares of batting that fit in the center of the batting shapes to give a little more dimension to the ornament. Lay quilt batting in the center of the shape. 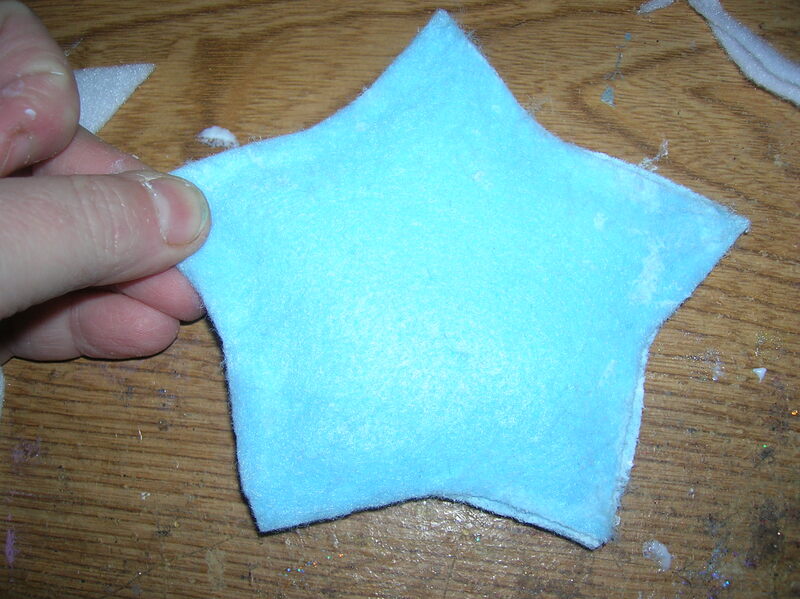 Or place a ball of cotton or fiberfill in the center of the shape. 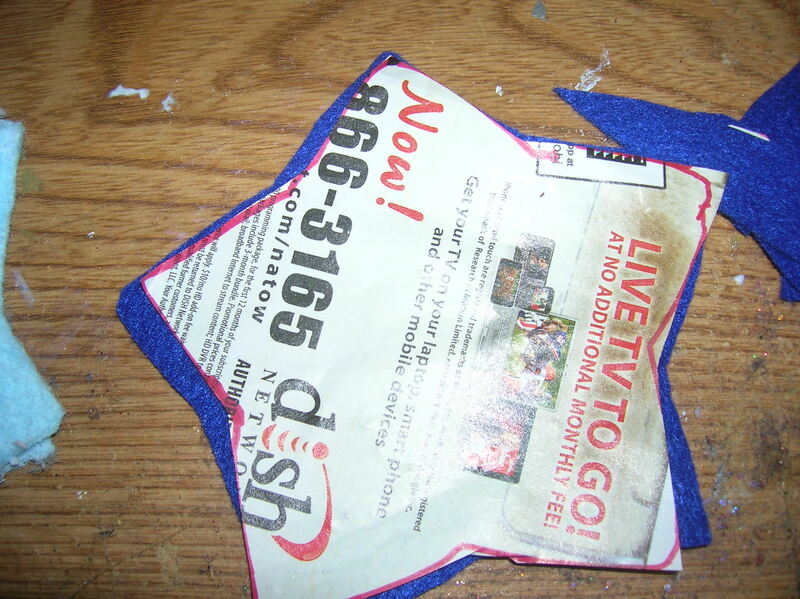 Apply a line of fabric glue around the wrong side edge of the bottom shape. 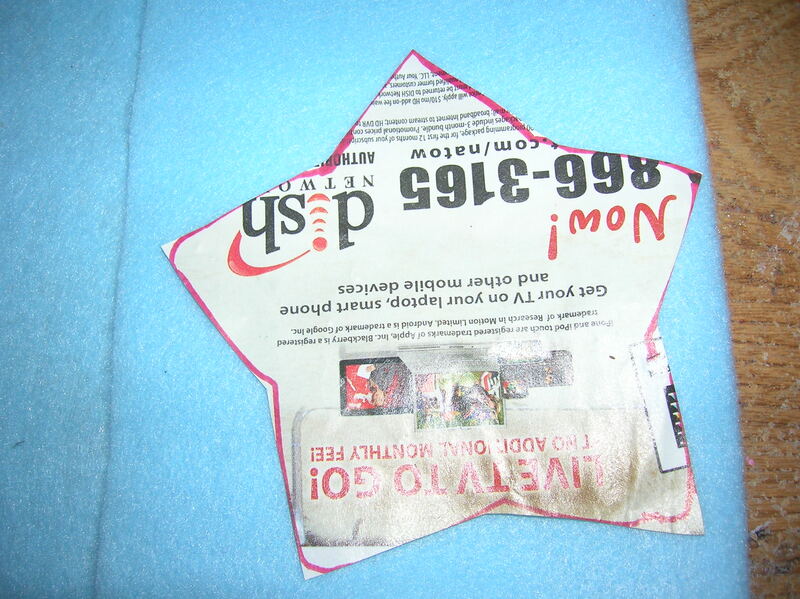 Put the top layer of the shape on top of the bottom right side up and crimp the edges closed. Secure edges with paper clips or small binder clips. You may need to decorate both sides of these ornaments if the glue and clips leave an impression. Decorate with felt shapes, buttons, ribbon, rick rack or lace as desired. Sew a yarn, ribbon or string loop at the top of each ornament and it’s ready to hang on the Christmas tree. Trace cookie cutter on newsprint. Pin pattern to double fabric (right sides out). 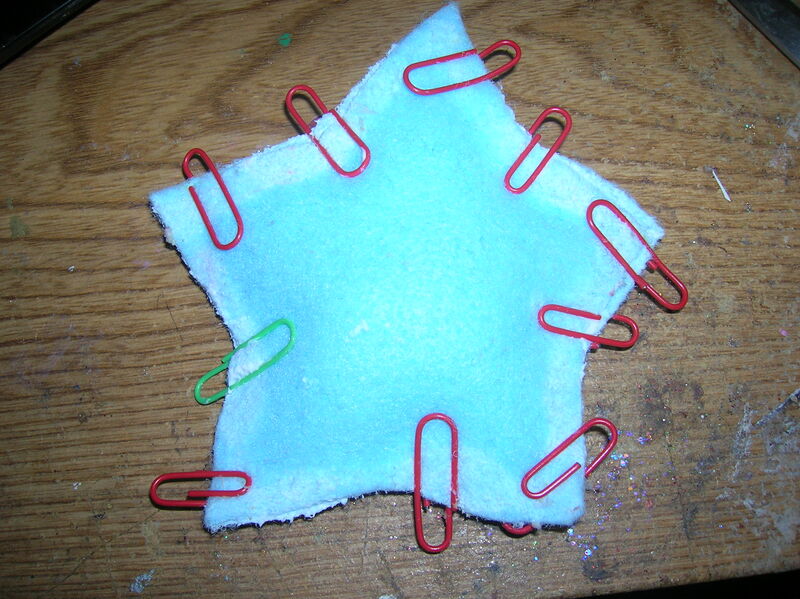 For glued ornament cut out several layers of quilt batting about 3/4ths an inch to 1 inch smaller than the felt shape. Place quilt batting in the center of the shape. 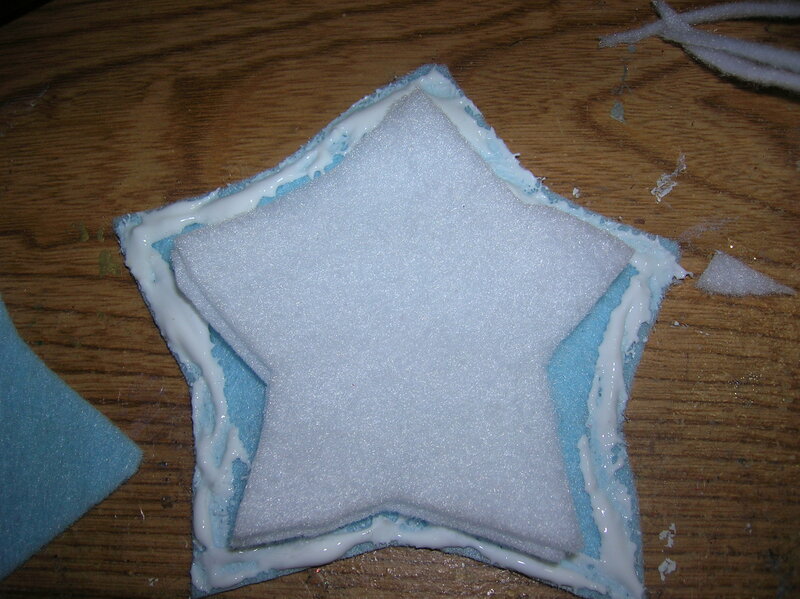 Cut several layers of batting in the shape of a square and add to the center of the ornament. 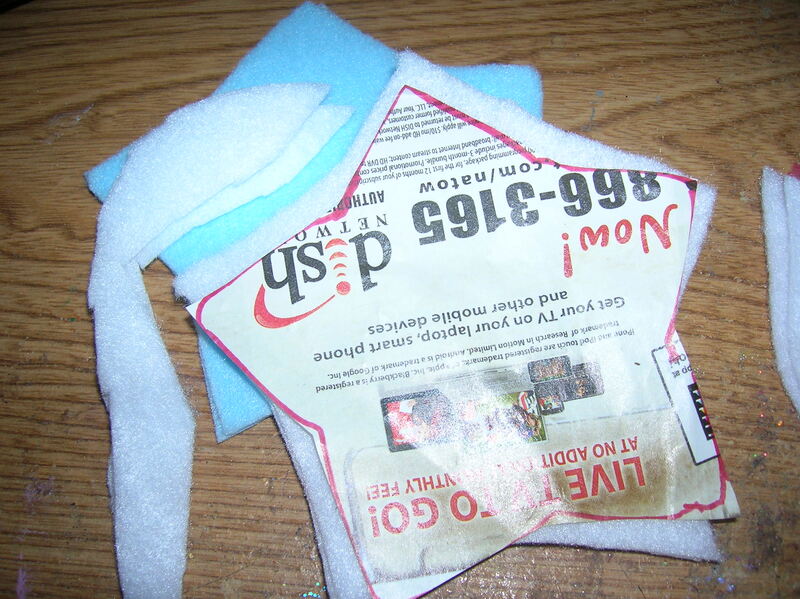 Apply a layer of fabric glue around the wrong side of the bottom shape. Place the top layer on top of the bottom layer and crimp edges closed. Clip glued shape together with paper clips or binder clips. 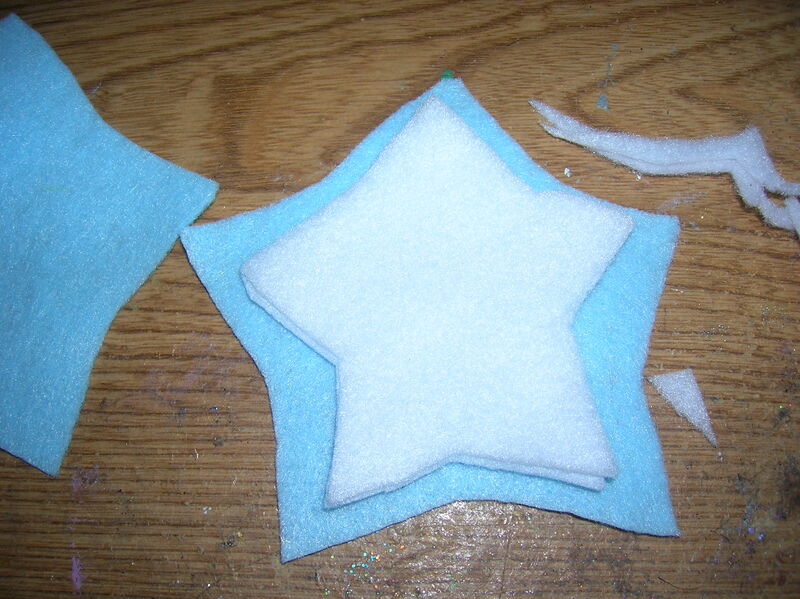 Trace and cut out a shape from a contrasting felt color. 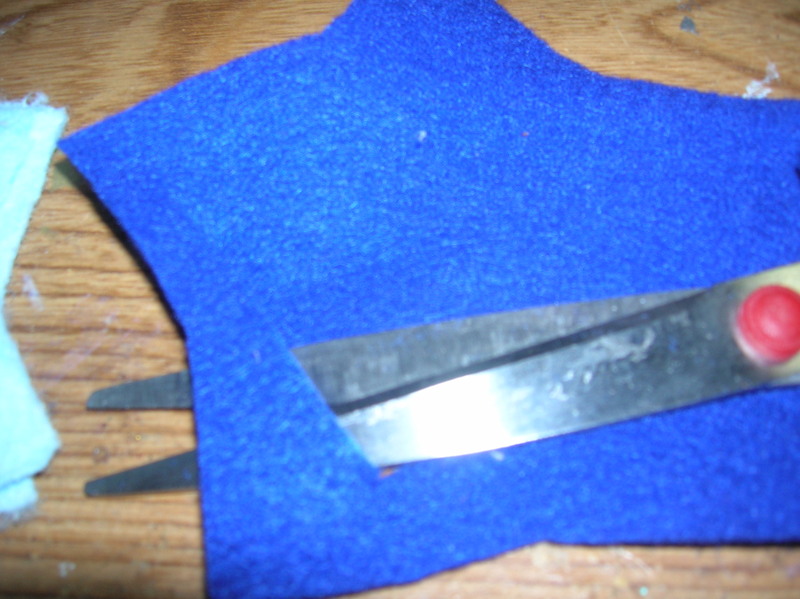 Fold fabric ablout 1 inch from the edge and snip a slit in the felt. Then trim around the shape leaving about a 1/2 inch border. Retain the middle. Glue border to shape. Cut a smaller shape from the middle of the retained center. Glue in the center. 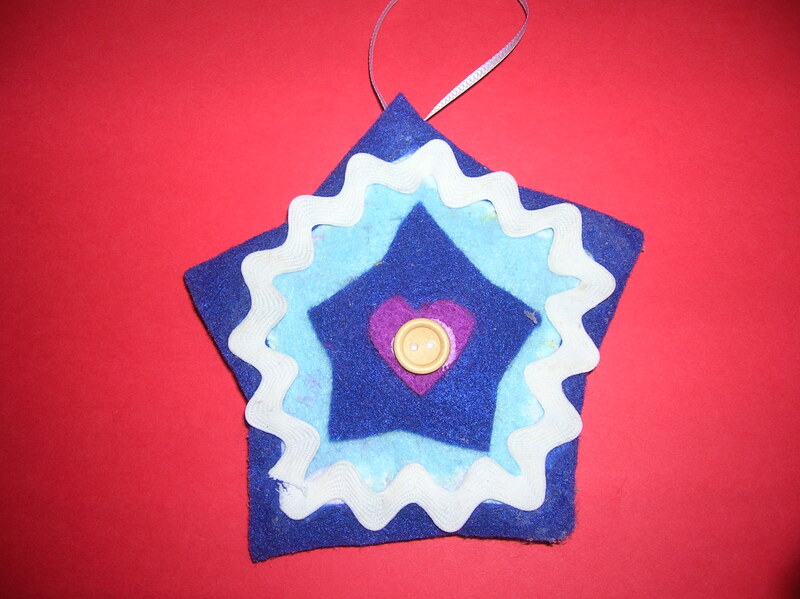 Add another shape from a contrasting color of felt for the center of the ornament. Add additional trim and embellishments as desired. 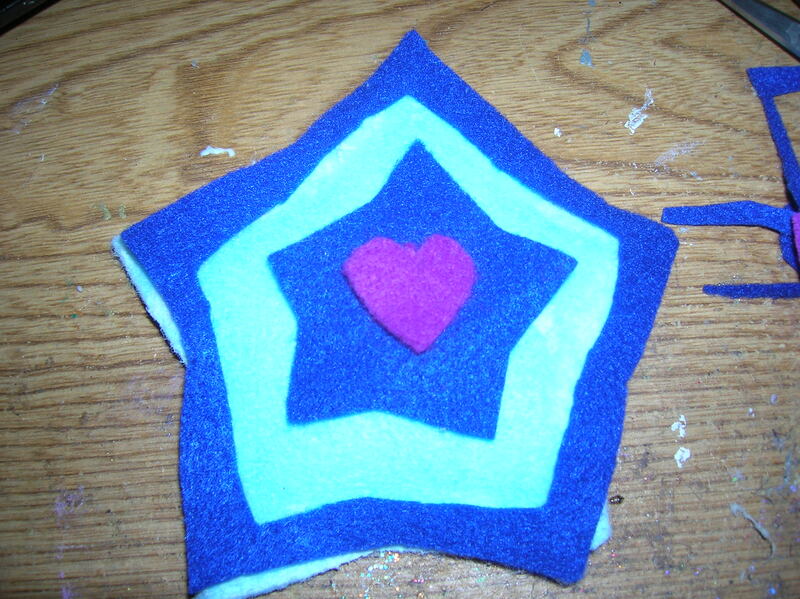 I added the flet border and rick-rack to cover the glued edge and felt shapes in the center of the ornament. A wooden button finishes off the ornaments.